Celebrating the Speaking of the Bhagavad-Gita - Monday, December 5, 2011 ~ The Toronto Hare Krishna Temple! Over five thousand years ago, Krishna spoke the Bhagavad-gita to Arjuna, discussing the fundamental principles of life. The Gita lucidly explains the nature of consciousness, the self and the universe. It contains both the essence of India's spiritual wisdom and the answers to questions that have been posed by philosophers for centuries. Today, that same Bhagavad-gita has been translated to numerous languages and is read by millions of people around the world, revered in academic circles, and studied by spiritualists of all backgrounds. 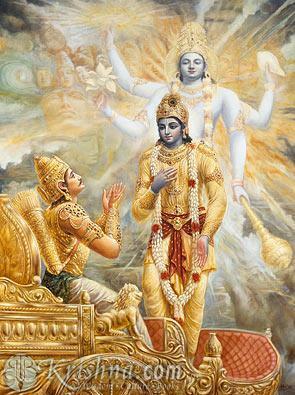 Monday, December 5th marks Gita Jayanti, the day when Lord Krishna spoke the Bhagavad-gita to Arjuna. We will be celebrating this occasion by reading the entire Gita in Sanskrit. The reading will begin at 6:00pm and will take approximately two hours. Stay tuned to the Toronto Hare Krishna Blog for more information! reading for the gita is important for all krishn bhakts. good fr you iskcon. bol bol bol haribol. hare rama hare krishn. Thank you for the encouraging words! Hare Krsna!